A Southeast front was pounding Haida Gwaii which had the QCL guides nervous with anticipation for the start of the 2017 season. Southeast winds generally bring in the famous “liquid sunshine” and this first morning was no different. As the first helicopter landed in front of the Totem House the rain seemed to magically subside, “Haida Gwaii Magic” as my good friend Cal Speckman would say! After a quick orientation, and guests now ready to jump in the boat to go fishing, I check the wind forecast one last time. Sure enough the wind is still projected to come quite strong throughout the day. Oh well, the life of a guide is wind and rain, GAME ON! After leaving the harbour I round the point at the dolphin and head for the west side of the grounds. The water seems calm… (Hmm…can I get lucky today with the wind?) 15 minutes later I stop at my favorite fishing spot, Yatze! 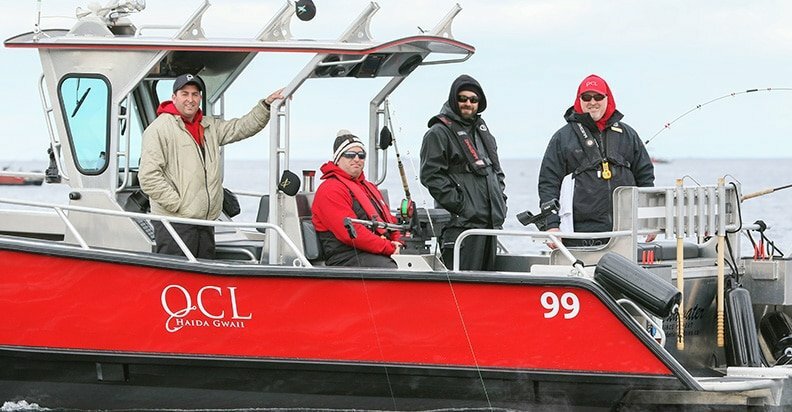 I drop the lines and quickly start explaining to Kevin and Rob, Ontario rookies, the simple instructions of how to use a single action Islander reel. During my instruction the first line goes off, guess we are learning on the fly!!!! Kevin grabs the rod and the fish is already on and peeling off line. I turn to instruct Bryan (a 40 time QCL pro-guest) to pop off the other line – we are going after this one, and to my surprise he sets into a second fish…DOUBLE HEADER to start the year, wahoo more magic!! 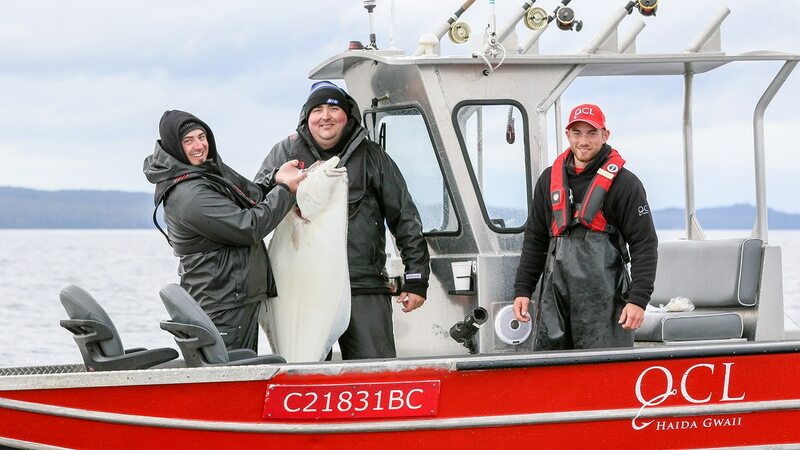 Haida Magic continued on Boat 99 for the rest of the day with “Mayor Rob”, “Cousin BK” and “sidekick Kevin” landing 16 Chinook for the first day of their salmon fishing careers. The wind never materialized and the sun came out at 5 pm treating the 99 to a spectacular night in the Haida Gwaii. The 99 was off to a magical start for sure. Saturday saw strong SE winds which limited the fishing and only allowed guests to hit the Eastern shoreline. “The Shaw” and Inskip Point saw the majority of the fishing boats with a wide variety of fishing success, most landing only a few fish each this day, and the hope was Sunday will be more successful. Sunday came the wind had subsided. Fishing was weak to start the day, one of those rare occasions when the early riser didn’t get paid off. The payoff was the evening slack tide and for those who stuck it out until the end. The SE winds brought in “Army Truck” looking squid and the Chinook were feeding on these tasty morsels! One of the QCL guides recognized this and switched tactics to a flasher and an army truck hoochie! BAM, it paid off and the guests landed a bunch of nice Chinook averaging 12 to 20 pounds. What an awesome way to end the day and the trip! 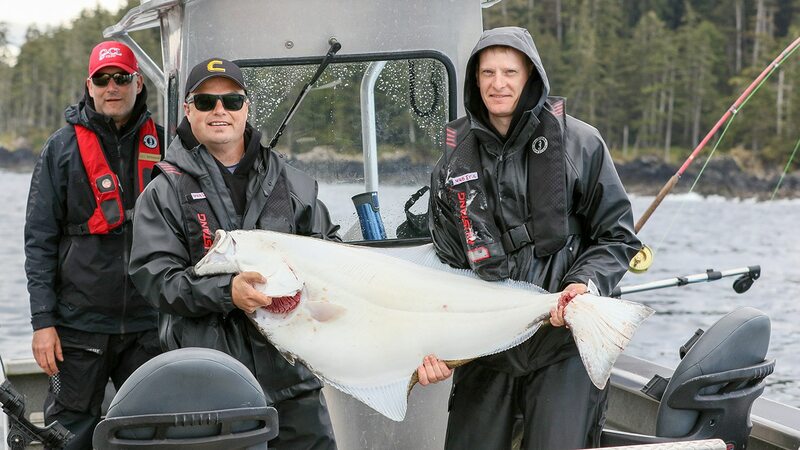 Although Halibut fishing was limited, guests were still able to easily target the flatties. Halibut fishing has started with a bang this season. 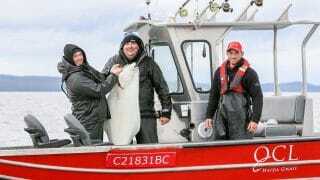 Mr. John Hedican landed and released two amazing halibut, a 93 pounder and a 218 pound giant from the deep!! Nice flatty John!! 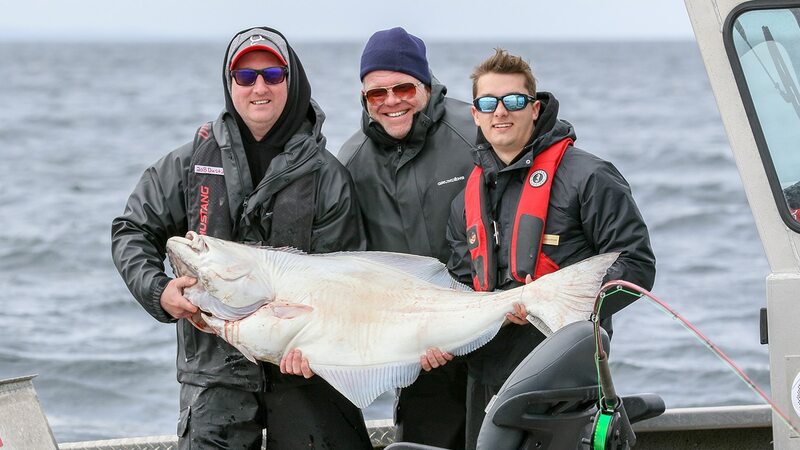 A pretty magical time for John as he was able to do this fishing with his son Kyle as his guide. Congrats Hedican family, glad you enjoyed the fishing and the magic of Haida Gwaii!